Former military secretary and Indian Army veteran Syed Ata Hasnain has been appointed the Chancellor of the central university in Kashmir. According to reports, the President of India Ramnath Kovind, in his capacity as the visitor to all central universities has cleared the appointment. The Army veteran and acclaimed academic has been appointed for a tenure of 5 years. It is notable that recently the President had appointed diplomat G Parthasarathy as the Chancellor of the Central University of Kashmir. As per the report in the Economic Times, while Parthasarathy replaced Governor NN Vohra as chancellor in Jammu central University, Lt General Hasnain will replace nuclear scientist Srikumar Banerjee in his post. Lt General Hasnain is a highly decorated Army officer. He has served in Jammu and Kashmir as the corps commander of Chinar corps and has also been reportedly a part of the track 2 diplomacy initiatives with Pakistan. A recipient of many Army awards, including the Param Vishisht Seva Medal and Uttam Yudh Seva Medal, he had started his military career in the 4th battalion of Garhwal Rifles. 65-year-old Lt General Hasnain had retired in 2013 as the military secretary. Lt General Hasnain is an acclaimed writer and orator too. He is associated with the think tank Vivekananda International Foundation. Both the appointments of G Parthasarathy and Lt General Hasnain is being regarded as key strategic moves as both have extensive experience in dealing with Kashmir and Pakistan sponsored terrorism. Many people have termed Lt General Hasnain appointment as an important step in curbing the worries of radicalisation and anti-national activities suspected in the educational institutions of the state. My heartiest congratulations to Lt General @atahasnain53 for being appointed as the chancellor of the Central University of Kashmir. General has served in Kashmir in many capacities during his career in the Army and I wish him all the best for the future! G Parthasarathy was the consul general of in Karachi. He was the Indian high commissioner in Pakistan during the Air India plane hijack incident in 1999. The state of Jammu and Kashmir is currently under the Governor’s rule after BJP withdrew its support from the Mehbooba Mufti government. The security forces in the valley have also constantly trying to eliminate terrorists and maintain peace in the valley. 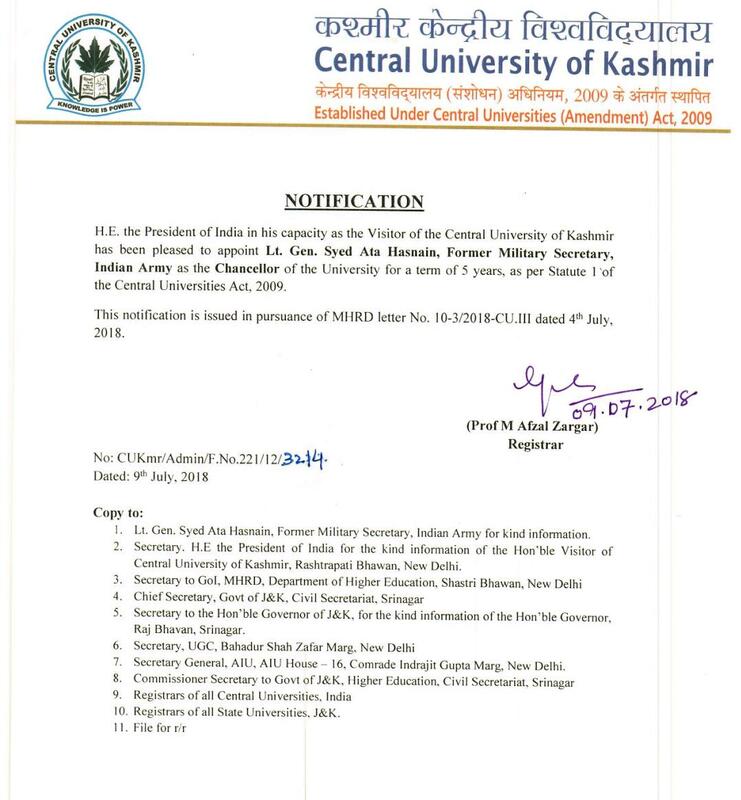 The appointments of Lt General Hasnain as the Chancellor of Kashmir Central University at such a time is being considered as an important move towards educating the Kashmiri youth to denounce radicalism and return to the mainstream. It is also notable here that recently the President has appointed many new Chancellors in Central Universities in Maharashtra, Odisha, Chhattisgarh and Kerala, Hyderabad, Tamil Nadu and Lucknow.